Liquid cleaner containing solvents and surfactants for on-line and off-line cleaning of charge air coolers. AIR COOLER CLEANER is a liquid blend of highly active cleaning compounds. It has been developed for safe, fast and economical in-service cleaning of the air handling systems of turbocharged diesel engines. By using AIR COOLER CLEANER, airborne contaminants that have been carried into and deposited on scavenger air trunks, air coolers and inlet valves are removed. Thus, all surfaces are kept clean and free of deposits. By using AIR COOLER CLEANER and the VECOM MARINE AIR COOLER CLEANER dosing system, fouling of air coolers is reduced so heat transfer and engine efficiency are improved. Pressure drops across the air cooler and air temperature after the air cooler are kept to a minimum. Fire hazards from the build-up of grease and residue are minimized. Downtime and expense of periodic dismantling of the air handling system for cleaning is eliminated. Scavenging efficiency is improved by the reduction of deposit build-up around scavenging ports. Reduces the adherence of airborne contaminants. AIR COOLER CLEANER is suitable for all types of diesel engines. The AIR COOLER CLEANER / fresh water mixture has no flash point and cylinder lubrication is not impaired. The suggested daily usage is 250 l/ton per air cooler. This is based on one injection every 24 hours. This can be varied based on performance of the pressure drops across the air coolers. AIR COOLER CLEANER can be applied by immersion, circulation or injection. For immersion and circulation, cleaning time is reduced considerably by heating the chemical to maximum 50°C. If the air coolers are very dirty it may be advisable to use undiluted product by means of circulation method to thoroughly clean the system before commencing AIR COOLER CLEANER injection treatment. The dismantled parts to be cleaned are laid in a tank specially designed for the purpose, which has been filled with undiluted AIR COOLER CLEANER. Movement is achieved by means of compressed air. Wash surface with high-pressure water hose or compressed air. The product can be reused for several cleanings. Cleaning time: 5 – 12 hours. Arrange to collect AIR COOLER CLEANER at bottom of unit with drain back to drum. Circulate by pump and/or spray (airless spray or steady low-pressure flow – do not atomize) on deposits through access doors. A perforated pipe placed between tubes is effective for reaching normally inaccessible tubes. Thoroughly saturate deposits and allow to stand for one hour minimum. Wash off with high-pressure water hose and drain to collecting tank. For best results AIR COOLER CLEANER should be circulated through the heat exchange unit for 6 to 8 hours, depending on the amount of deposits present and the length of time since the last cleaning. When the product is used as a preventive maintenance item periodically, circulating times can be substantially reduced. AIR COOLER CLEANER solution can be saved and reused until it becomes thoroughly contaminated. 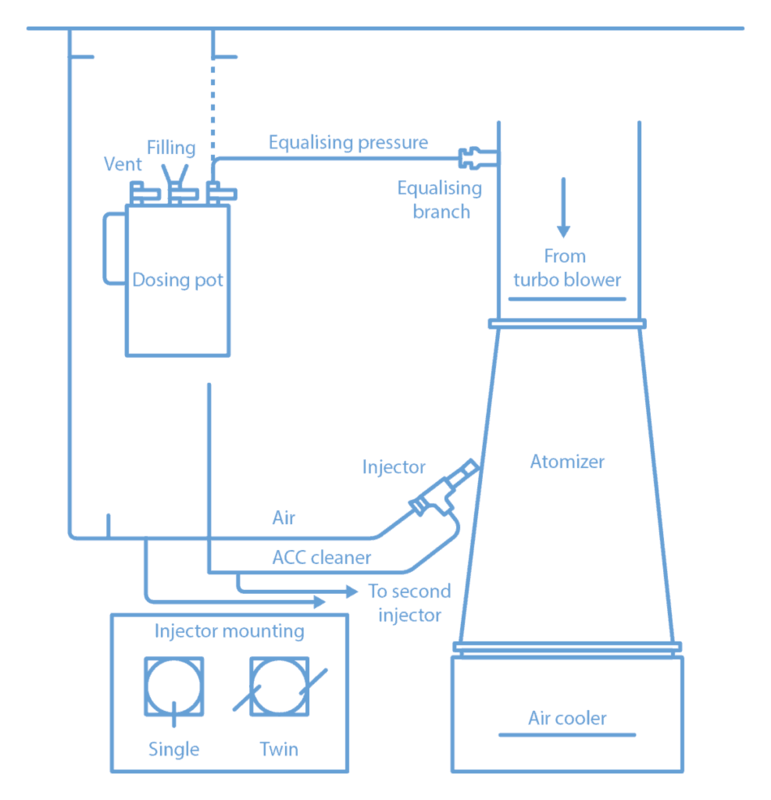 Flushing unit with kerosene before using AIR COOLER CLEANER will prevent excessive dilution. During cleaning, solids may accumulate in reservoir drum. These solids may be removed by allowing the solution to settle and decanting clean liquid from the top. When cleaning action of AIR COOLER CLEANER has been reduced by excessive dilution with fuel oil, the material can then be dumped into the bunker tanks and then burned. For circulating AIR COOLER CLEANER a pump with a large discharge volume should be used in order to insure rapid ow through the unit. 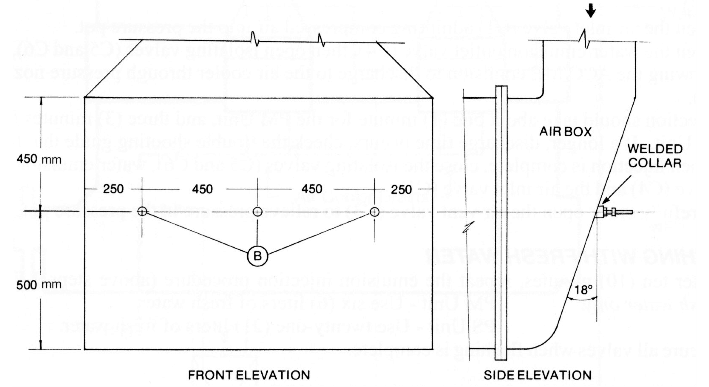 A 50 or a 200 l drum fitted with a wooden cover containing an opening for the discharge pipe can be used as a reservoir. Use enough product to fill the unit, piping and enough additional material to keep the reservoir one third full. 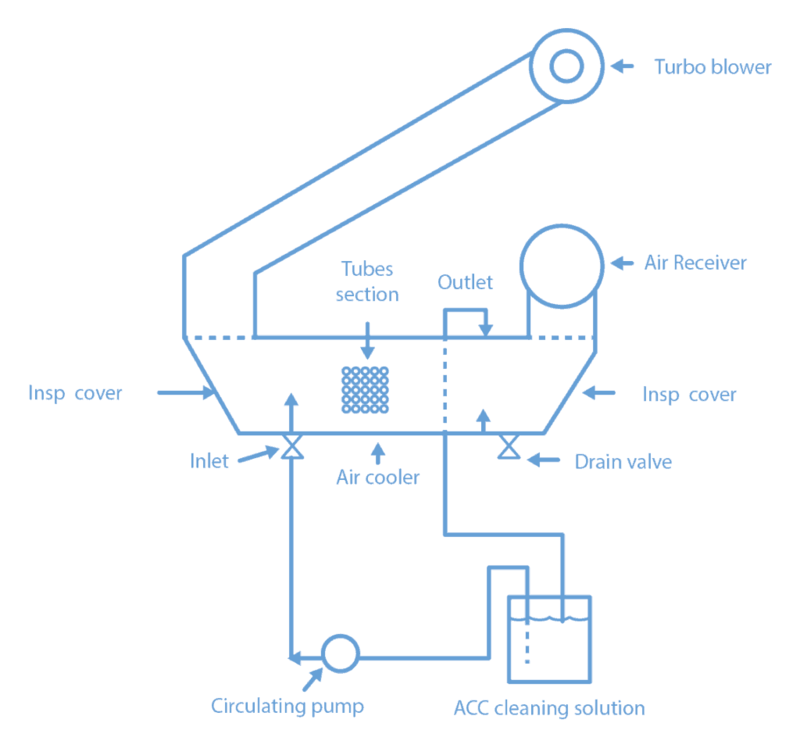 Take pump suction from the reservoir and discharge into the lowest connection on the heat exchanger. Pipe the overflow from the highest point on the heat exchanger back into the reservoir. A fine mesh screen should be adapted to the reservoir return to remove large pieces, which become dislodged during the cleaning operation. 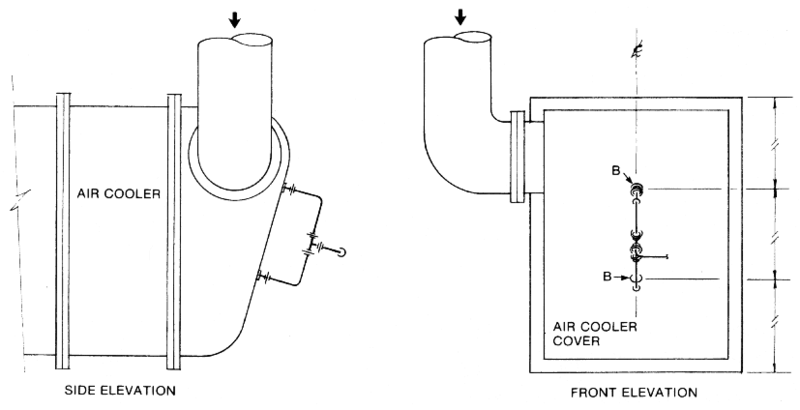 To avoid the dislodging of loosened particles, a method of back-flushing can be used as indicated in schematic drawing showing recommended hood-ups for use of AIR COOLER CLEANER. Simple, safe application of AIR COOLER CLEANER is provided by use of the VECOM MARINE AIR COOLER CLEANER Injection System. This system consists of a steel 6 l dosage tank, complete with all necessary valves, an atomizer and required fittings for 6×8 mm copper tubing. The dosage tank may be installed in any appropriate place in the engine room. 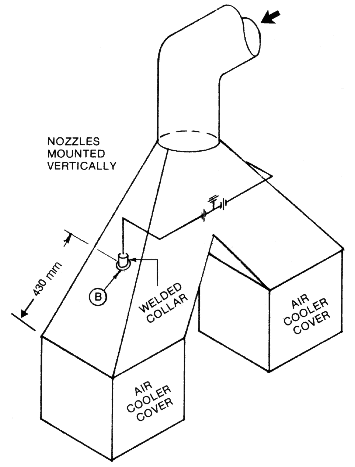 Copper tubing (6×8 mm) is fitted from the dosage tank to the atomizer, from the dosage tank to the casing on the pressure side of the turbo blower (equalizing line), and from the ships’ compressed air system to the atomizer. Fill the dosing tank with the required quantity of AIR COOLER CLEANER / fresh water mixture. Close the tank. Open valve 1 (compressed air for atomizer). 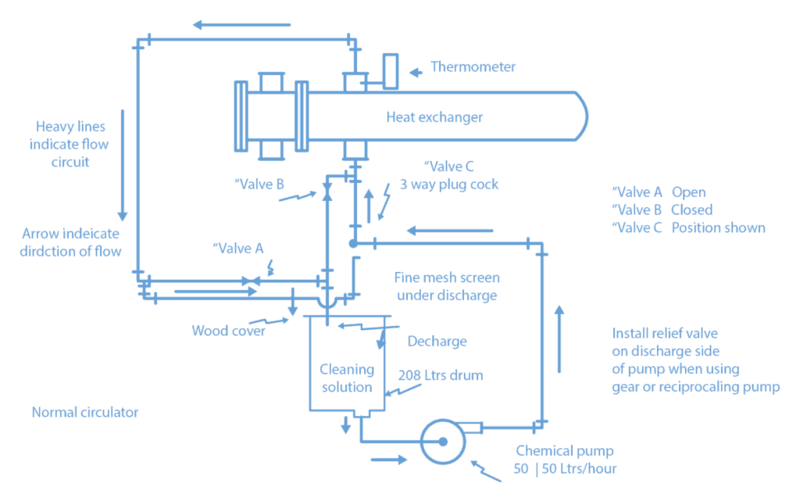 Open valve 2 and 3; following equalization of pressure to the scavenging air line the AIR COOLER CLEANER / fresh water mixture is injected in about 5 – 10 minutes. Close valves 1, 2 and 3. Open valve 4 to vent air from the tank. Fill the tank with fresh water. Close the tank. Repeat steps 2 – 5. AIR COOLER CLEANER is usually available in steel drums of 25 l.
These installation drawings are only a guide for typical installations. 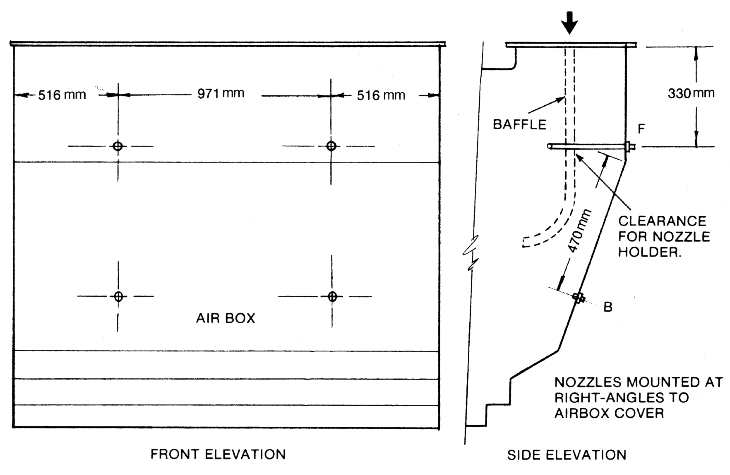 Air trunking dimensions, configuration and baffles arrangement may differ between engines of the same model. 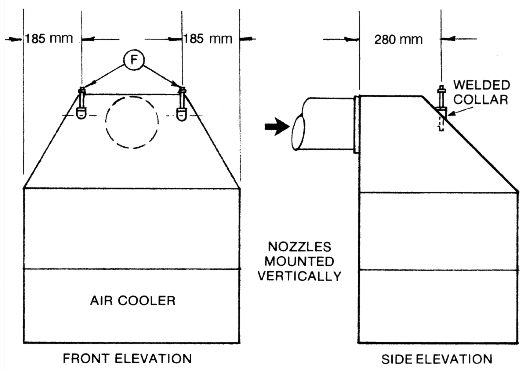 Physical inspection is necessary to ensure that nozzles are correctly sited and installed. These drawings are not to scale. All dimensions are in millimetres.